Here it is… with a beautiful cover by Don Schumann. 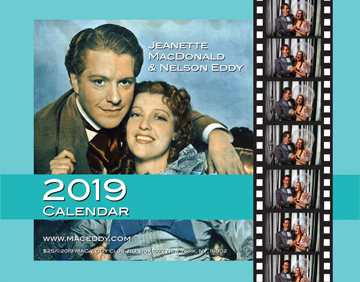 Each month features a different fabulous, glossy photo annotated with dozens of NEWLY UPDATED, interesting, informative and fun dates, facts and events in the lives of Jeanette and Nelson. 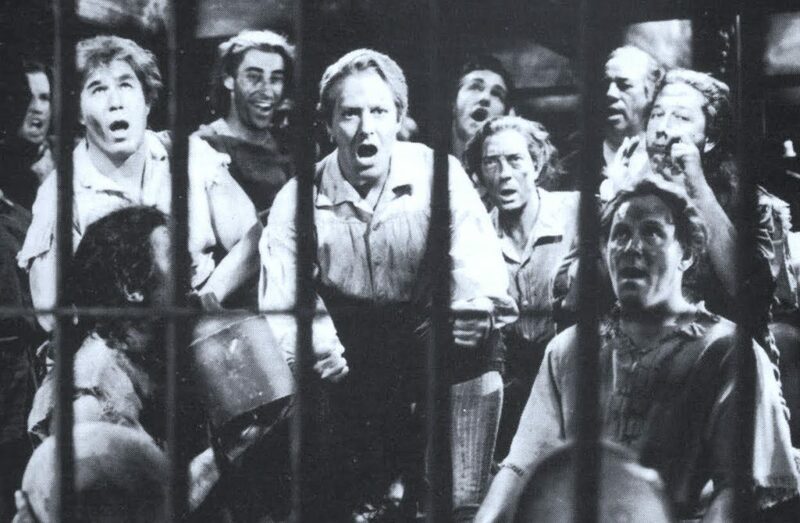 Above we see a shot from “New Moon” with Nelson Eddy … and Buster Keaton to the right of him. Buster Keaton was a WWI veteran. Today we celebrate Armistice Day 2018 … the 100 year anniversary. Through all my years of research I was lucky enough to meet and interview several Hollywood folks from the silent years and onwards who participated in WW1. 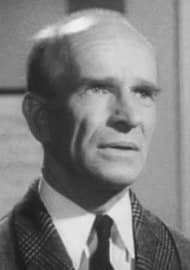 For example, if you’re an old movie buff you’d probably recognize character actor Ian Wolfe (pictured below) who appeared in many great films (including “Maytime” and “The Firefly”). Wolfe was a WW1 vet and a client of my father’s. I also met Buster Keaton (he was mostly cut out of “New Moon”), who lost much of his hearing during WW1 while fighting in France. Remembering that great generation today… thank you . 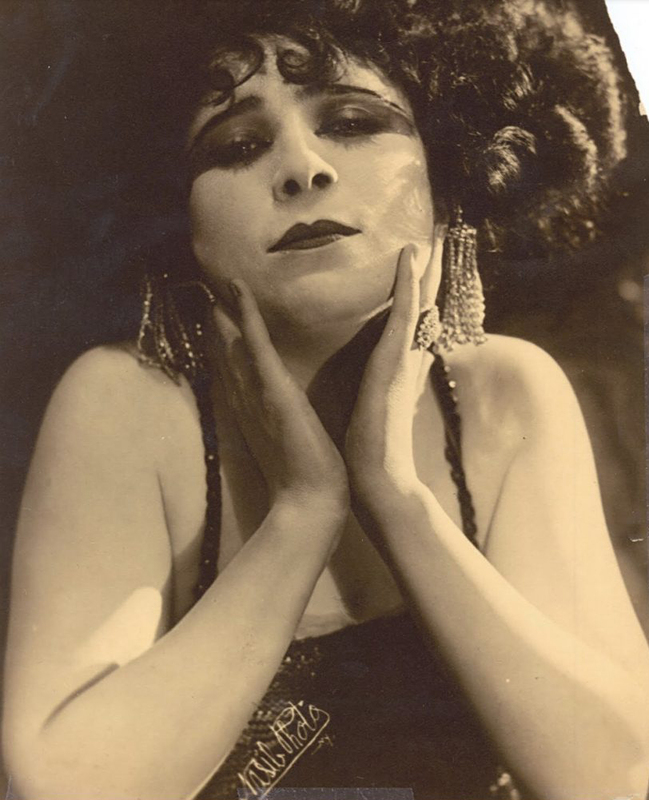 The photo above is a closeup from Ned Wayburn’s “Demi Tasse Revue” which opened at the Capitol Theatre on October 24, 1919. Take a close look at the girl in the center of the photo…yes, she resembles Jeanette MacDonald but those dimples give her away. It’s Jeanette’s older sister Blossom, who spoke up to Wayburn and got Jeanette her first job in the same show. 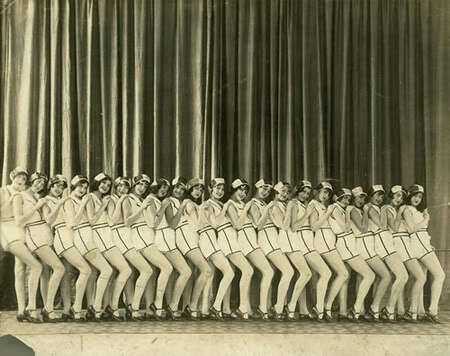 Below is the full lineup of dancing girls. 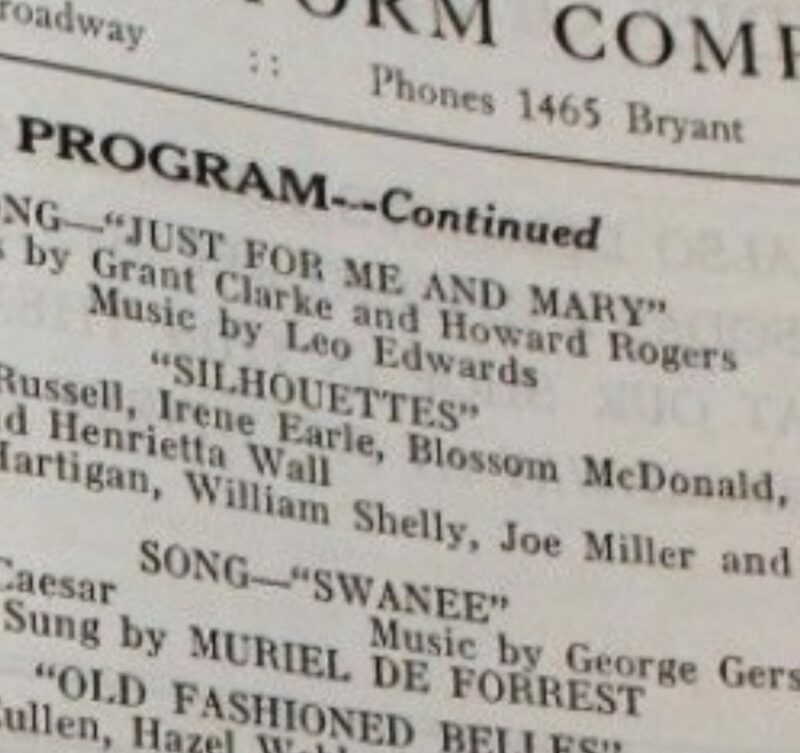 And a closeup from the program, showing her billing as Blossom McDonald, still using the original correct Irish spelling of their last name. In this important show, George Gershwin introduced his song “Swanee” while another actress had her own scandalous featured song. Recognize her? It’s Mae West! But most important to readers here is Blossom’s younger sister, all of 16 when she landed her first small part. Already her beauty stands out above the others. 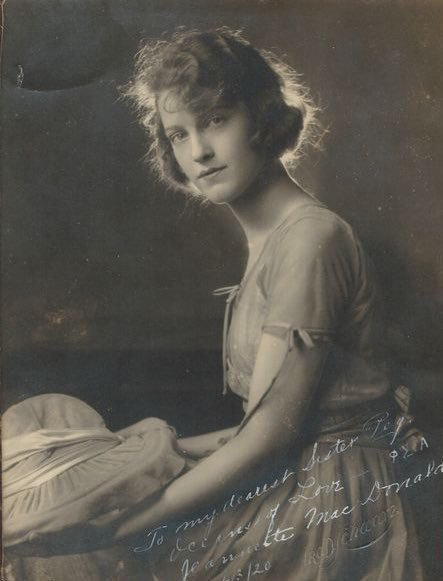 Below, a signed portrait of Jeanette from 1920; note she’s still spelling her name “Jeannette.” But don’t be fooled by her waif-life beauty, the set of her chin and those determined eyes reflect a young girl ready for stardom.